Trinity Sunday calls us in two slightly different directions. It is an opportunity to tell the children about the trinity which is often referred to in worship, but seldom explained. Fairly simple introductions of the Trinity and highlighting its use in worship helps. But, Trinity Sunday is also really “God Sunday,” an opportunity to celebrate the mystery of God that is more than we ever fully understand. Both are important to children. 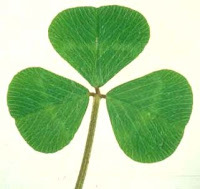 leaf of the clover is a leaf and only together are they a clover. Name the three persons and briefly mention things we know about each one. Early in the service challenge worshipers to be alert for “father, son, and holy spirit” in your songs, prayers, and stories today. Even fill your pockets with wrapped candies for anyone who can tell you as they leave the number of those references in today’s worship. p Celebrate God who is more than we ever understand. Many children assume that the adults all know everything there is to know about everything – including God. If during their childhood they are told repeatedly that this is not true, when they begin asking important questions about God they will know they are not being outrageous, but doing what everyone does and has done for years. That makes a big difference. So, today celebrate both what we know about God and the God who is more than we can ever understand. The Roman Catholic lectionary for the day offers God’s name, “I am who I am, I will be who I will be,” from the burning bush as the Old Testament reading for the day. Today is a good opportunity to ponder that name. - What was God doing before God created the world? - How can there never be a time before or after God? - How can God pay attention to each person in the world all the time? - Why did God create rattlesnakes and mosquitoes? p If there is a conversational time with children, gather “I wonders” about God. Begin by telling some of the things you wonder about. Invite them to tell some of the things they wonder about. Be sure all worshipers knows that no honest “I wonder” is too funny or too bad to be pondered. p Sandy Sasso’s beautifully illustrated book In God’s Name tells that after creation all animals had names. But God did not. So, all the animals came up with their own name for God, none of which was complete without the others. p “Immortal, Invisible, God Only Wise” is filled with long complicated words that describe God who is more than we can fully understand. If this is pointed out, children enjoy all the impossible words praising God who is impossible for us to understand. Before singing, point out and define the first few words of verse one – immortal means God lives forever, invisible means we can’t see God. Then ponder the meaning of the first phrase of verse 2 (“Unresting, unhasting and silent as light”). Finally, challenge worshipers to pay attention as they sing to what it is trying to say about God. p “Holy, Holy, Holy” is often sung. Before singing it today, define the word holy (most special and important, awesome) and briefly walk through the verses. This helps children learn the hymn and makes all worshipers pay better attention to what they are singing. p In advance, ask the children to help you create a processional reading of this scripture. Ask them to prepare large poster board illustrations of things God made and to mount them on dowels. As the accounts of the days are read, children carry in the posters for that day down the central aisle. At the conclusion of the day, those children say, “And there was evening and morning, the first/second…. day.” Children remain at the front until the entire week is read. This could be done by as few as six children or by as many as are available and fit in the space. With fewer children the last day’s posters could include pictures of many kinds of critters. If there will be lots of children, each child may make a poster of a single critter of their choosing. Singing a creation hymn immediately following this processional reading gives the children time to return to their seats. This is a project for several church classes for several weeks. One week will be needed to make the posters. One rehearsal will be needed just before the service. And, adult help getting everyone started down the aisle in correct order is essential. It is not a small effort, but both children and adults enjoy reading the familiar story this way and the children feel they are definitely part of the worshiping community. 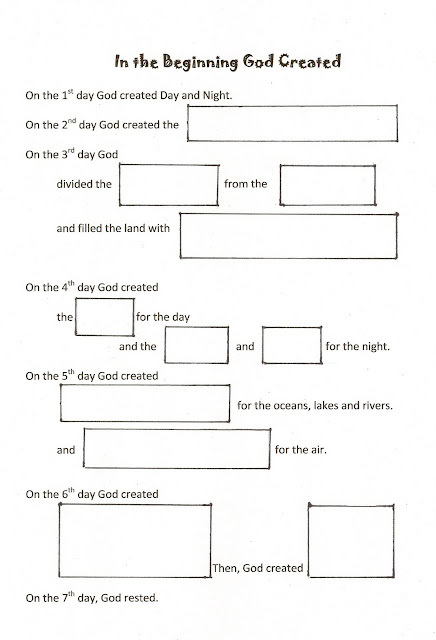 p Give the children an In the Beginning God Created worship worksheet on which to draw pictures of each thing created on the day it was created. p There are several DVDs and even CDs available of James Weldon Johnson’s poem “The Creation” which retells the creation story from an African American perspective. It is also presented in a picture book: The Creation (ISBN 9780823412075). 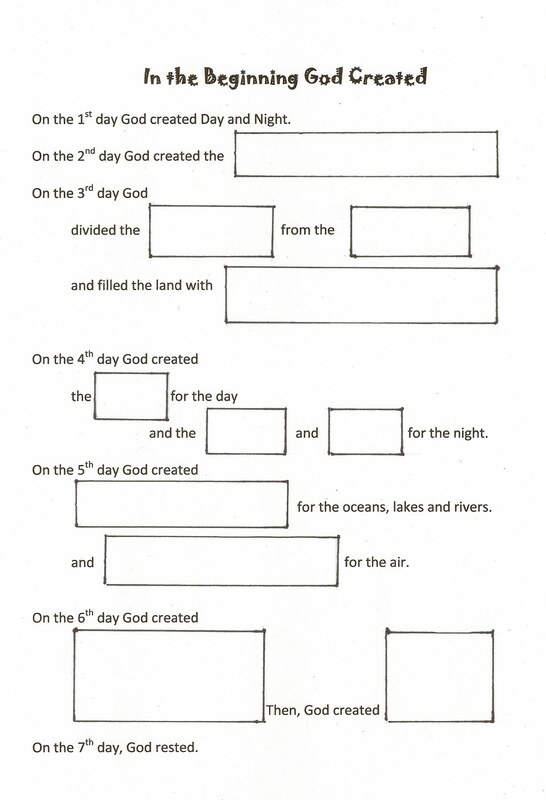 p Pair the creation story with Psalm 8 to explore our place in the world at the beginning of summer and Ordinary Time. During summer children generally spend more time outside. Challenge them to take care of God’s world. There are lots of things they can do, e.g. not toying with or hurting the critters and plants where they play, not leaving trash (dropped candy or gum wrappers! ), leaving every place we go a little better than we found it, etc. During Ordinary Time in worship we focus on learning and growing as disciples and a church. This pair of texts tells us we are created in God’s image, said by God to be good, and are given the task of care for the world. That is a good start for Ordinary Time. - “All Things Bright and Beautiful” may be familiar and is filled with familiar, concrete words about creation. - “Earth and All Stars” has a repeated chorus. Children enjoy calling on very modern things to praise God. p Read from Today’s English Version which uses vocabulary children understand more readily – “Lord” instead of “Sovereign,” “greatness” instead of “majesty,” and the moon and stars that you “made” rather than “established.” Most adults will not notice the difference, but the children will. p To explore our relationship with God and our place in the world, read “Partners,” a midrash about the creation story in which God introduces people to their role as God’s partners. The final definition of partner is “…someone you work with on a big thing that neither of you can do alone. 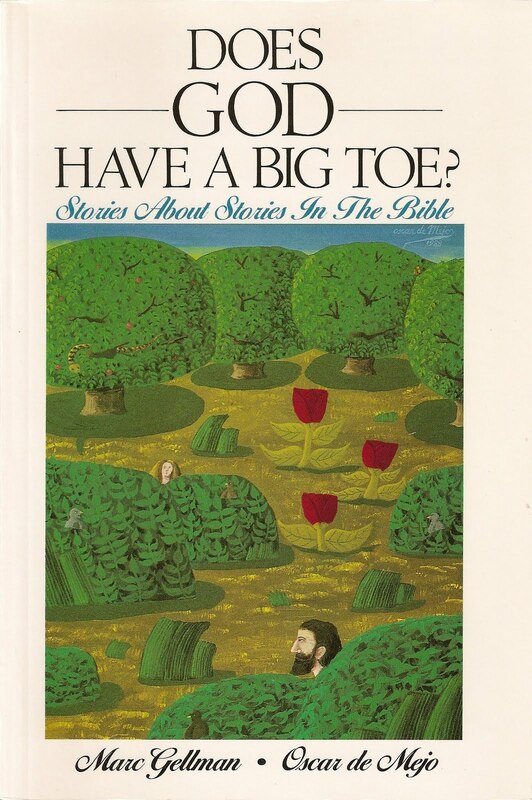 If you have a partner, it means that you can never give up, because your partner is depending on you….” Find this two page story (read aloud in 3 minutes) in Does God Have A Big Toe? By Marc Gellman. p Paul concludes his letter to the Corinthians who tended to fight with each other about almost anything, “agree with one another, live in peace.” That is good advice on Trinity Sunday when we celebrate the mystery of God. 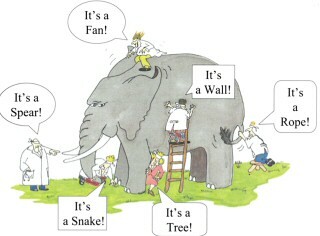 The blind men exploring the elephant story fits well here. If those blind men talked to each other about what each one had learned about the elephant rather than fight insisting that only what they knew about the elephant was true, they would learn a lot more. Likewise if we talk about all the different things we know about God, we will learn more about God than we will insisting that only what we know is true. be with you all today and every day. As you do, define any words you traditionally use, e.g. the communion of the Holy Spirit. (Children hear communion as a reference to the sacrament and miss the intended meaning of the phrase.) Finally, offer the benediction as you generally say it so that worshipers will hear it with fuller understanding. p On Trinity Sunday point out that we are baptized in the name of the Father, Son, and Holy Spirit. Invite the children to meet you at the font. Using a doll or a person, demonstrate the use of water and say just the words that are said as the water is used. (Do not get bogged down in all the words that lead up to “the event.”) Take time to explain that this means each of us belongs to God the Father, the Son and the Holy Spirit. Whether we are baptized as a baby or an adult, we don’t understand what that means when we are baptized. Actually, we spend our whole lives learning what that means and never completely figure it out. But, we still belong to God. One thing in particular which caught my attention is the procession you suggested for Trinity Sunday - with the kids bringing in posters representing each day of creation to correlate with the scripture reading. I was thinking about a variation on that (to make it easier for my little guys) - of them "dancing" in with streamers representing each day (white/black for day/night, light blue for sky, green/dark blue for land/water, orange/white for sun/stars/moon, dark blue/brown, for water/birds, and rainbow streamers for animals/people). Bringing them in one at a time, then creating a display to remain in the worship space for that Sunday. Making streamers would be easier than doing posters (for my guys, at least) and it could really make a beautiful visual display for worship. I'm even already writing a song for them to sing during the procession (which the congregation could sing too), going through each day of creation. If I get it written I'll post it on my website, in case others would like to use it. Thanks for the ideas!